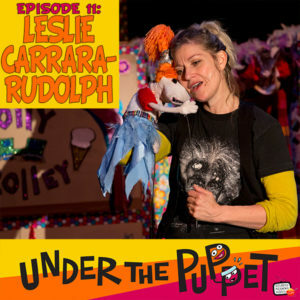 http://www.UnderThePuppet.com – Leslie Carrara-Rudolph’s first big puppet job was working on Muppets Tonight alongside Frank Oz, Jerry Nelson, Dave Goelz and Kevin Clash to name a few. Currently she is Abby Caddabby on Sesame Street and Bubbles in the Jim Henson Company show Splash & Bubbles. In this interview we talk to Leslie about her puppetry work including developing characters, producing your own puppetry show and using puppets to perform outreach for kids. I was delighted, although somehow not even a little bit surprised, to learn that Lilly Lardpop has Jedi powers and can beat Kylo Ren. She’s pretty amazing! And only 5 years old, too!